Stem cell research at the University of California, Riverside is about to gather speed thanks to the establishment of a new Stem Cell Core Facility (SCCF) - a shared facility providing infrastructure, equipment, and trained personnel for doing stem cell research that ordinarily would not be available in most laboratories. The SCCF, located in Noel Keen Hall, had its grand opening on Friday, Jan. 29. More than 200 visitors from all over Southern California attended the celebration that included tours of the Core labs, demonstrations of the facility's new equipment, posters on stem cell research being done at UCR, information on how to get started in stem cell research, and contests with prizes for the best posters and images. Several vendors demonstrated their products related to stem cell research. "We are the only such core facility in the Inland Empire," said Prue Talbot, the director of the Stem Cell Center and the SCCF. "Such a facility is needed on campus to give an opportunity to UCR researchers who are interested in doing stem cell research but who don't have a facility for it. The facility also greatly benefits labs on campus that are already doing research on stem cells but that lack the expensive equipment the SCCF has to offer." The SCCF was funded primarily by a grant from the California Institute for Regenerative Medicine. The $2.8 million grant helped construct the 2000-square-foot facility, purchase state-of-the-art equipment, and manage day-to-day operations. Talbot expects the SCCF to produce breakthroughs in stem cell research at a much faster pace than before, assisted by its Nikon BioStation CT incubator with a powerful microscope that already has generated useful data in conjunction with video bioinformatics. UCR is the first institution in the country to purchase the Nikon BioStation CT technology. "The BioStation technology coupled with UCR's expertise in video bioinformatics will greatly facilitate our ability to understand dynamic cell processes and will provide data essential for attacking degenerative disease," Talbot said. "Faculty planning on using this instrument and other Core facilities have interests in osteoporosis, diabetes, wound healing, neurodegeneration and brain damage, and infertility. UCR also has labs that use BioStation technology to prevent disease by identifying environmental toxicants before they can harm humans." Approximately 10 laboratories on campus will use the SCCF. 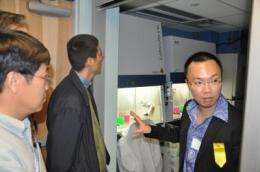 The facility is open also to scientists not at UCR. Users will be recharged for supplies at a fair price.